All the fun and colour of a traditional Christmas pantomine returns to the London Palladium with Cinderella Theatre Breaks. Hurry – Last remaining performances ! The world famous West End venue promises a star-studded cast, lavish costumes and amazing sets when it opens its doors in December and welcomes audiences of all ages to enter a truly British tradition of custard pies, pantomine dames, audience sing-alongs and lots of laughs as the much-loved fairytale of Cinderella proves dreams can come true. With performance times to suit all members of the family and extra shows during the Christmas school holiday, make sure you book your Cinderella Theatre Break now to avoid disappointment. 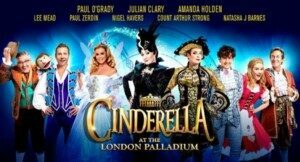 Amanda Holden as the Fairy Godmother; Natasha J Brown as Cinderella; Paul O’Grady as the Wicked Stepmother; Julian Clary as Dandini; Count Arthur Strong as Baron Hardup; Paul Zerdin as Buttons; Lee Mead as Prince Charming and Nigel Havers as the Lord Chamberlain. The London Palladium is just off Oxford Street by Oxford Circus. It is easy to get to by bus or tube if your Cinderella Theatre Breaks hotel is not within walking distance (of which there are many!). Oxford Circus underground station is the closest, with access to the Victoria, Bakerloo and Central lines. Nearest hotel is the 5 star Courthouse Hotel just around the corner from the theatre; for families try the 4 star Radisson Blu Grafton in Tottenham Court Road or the 3 star St Giles hotel (with the added bonus of swimming pool!) at the top end of Oxford Street behind the Dominion theatre. Performance times: Tuesday to Saturday at 1930; Tuesday, Wednesday, Thursday & Saturday at 1430; Sunday at 1300 & 1800.